It is indicated in places I’ve read that the elimination of the appraisal fee for loans under $400,000 is to help save the consumer some money, the very small appraisal fee. What? The appraisal fee is typically the lowest charge of all involved in a real estate transaction. If “they” want to save the borrower some money “they” should eliminate the commissions paid to Realtors. Make it a fee for the sale of a home, like an appraiser gets. Oh please, don’t even go there saying the seller pays the real estate commissions and not the borrower. Where do you think the seller gets the money to pay the outlandish commissions anyway…from the borrower via the sale price which includes the real estate commissions. When doing an appraisal, I’ve been asking people I encounter involved in the process (not the Realtor though, although some agree) if they believe that a Realtor works twice as hard and if they think the Realtor is worth twice the amount they receive for selling a $400,000 property over a $200,000 property. What do you think the answer is? Not one person has ever said yes. Realtors are highly overpaid for what they do. And what they did at one time is not what they do now. They do even less now and get more because of the increased sales prices. The commission Realtors receive is where the helping the consumer should start. The appraisers now (at least I do) have become the “prudent purchaser” in the transaction. The Realtors (buyers agents) no longer function as a watch dog for their client to ensure they do not overpay for a property. They are only concerned with the transaction and going along with the “deal”. The appraiser (some of us anyway) have become the “prudent purchaser” in the transaction. I dig into the data, perform the due diligence the Realtor of old used to do. Eliminating the appraiser in these transactions only harms the consumer, it does not help them at all. I’m very proud of what I do for the consumer. 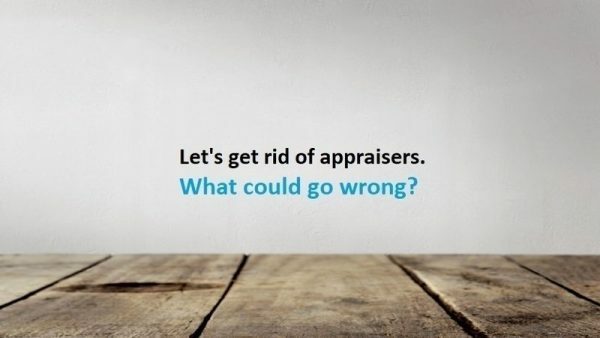 I’ve been in the appraisal industry since 06/01/1966 and have been a Realtor since 1974. Thanks David. Well said. Whenever something doesn’t make sense, there is usually a reason.